ENTERTAIN, INFORM AND STAY IN TUNE WITH GYMS & FITNESS CLUB MEMBERS! Visual communication is essential to the gym and fitness centers member experience. It’s how operators communicate with their members and enhance their experience. QL helps you enhance your communication across digital displays. 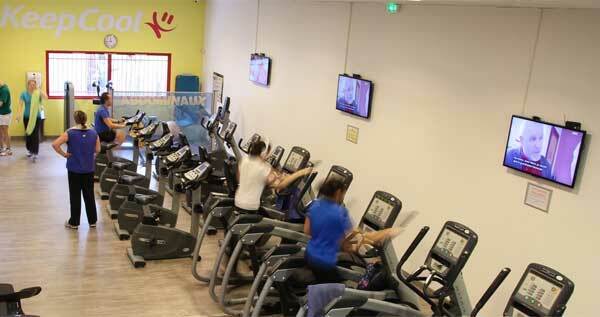 QL powered digital signage keeps gym members informed and entertained while they train. But QL also does much more. The same system that drives your screens can also manage background music for the facility and deliver the content to speakers and headsets. Programming can be interrupted at any time to display instant messages using audio, text, or both. Screens are great for broadcasting engaging content. Part of the programming can be managed from head office and the rest can be managed at each location by the franchise owner or operator. QL is a perfect choice for this due to its multi-user capabilities. The entire digital signage network is permanently connected to head office. Gym schedules, training room bookings and special events are managed centrally and content can be updated without any user intervention. QL can also help run your training classes. Classes can be offered without any local trainer and instead managed via a self-service app. In these settings, a video wall will be used to display training instructions and motivational messaging. The system is entirely managed through QL and content is triggered using a tablet accessible to members. 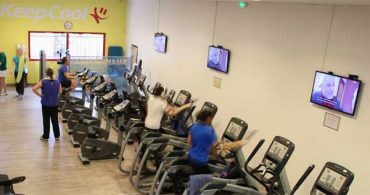 Videos and audio broadcasts are used to promote fitness center services such as spa/massages, restaurants and beverages. Navori QL has proven to be an ideal solution for gym and fitness clubs. In fact, the largest fitness network in the world uses QL to power their displays. Sounds interesting? Contact us to find out more. Attract sportswomen and sportsmen attention. Encourage to outperform physical limits. Advertise facility promotions and sponsors. Showcase persuasive messages to improve performance.